Skiing and snowboarding in deep powder is very enjoyable. 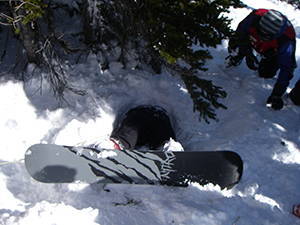 However, tree wells, areas of loose, unconsolidated snow at the base of trees, pose a hazard for the unwary, and can lead to death from Snow Immersion Suffocation (SIS). In studies, 90 percent of those who were voluntarily buried in a tree well could not dig themselves out without assistance. When skiing in areas where tree wells and deep snow are a potential hazard, always ski with a buddy.